Knoll is pleased to announce Bertoia Two-Tone, which expands the Bertoia Diamond Chair and Bertoia Side Chair’s available colors to include mix-and-match offerings for the basket and base. Based on the color-blocked configurations that were originally available when the Bertoia Collection launched in 1953, Bertoia Two-Tone allows customers to design their own color combinations from a selection of colors and finishes—black, white, red, blue and chrome—to create unique expressions of two of Bertoia's most iconic designs. Womb Settee and Bertoia Two-Tone Diamond Chairs, 2016. Photograph by Knoll. 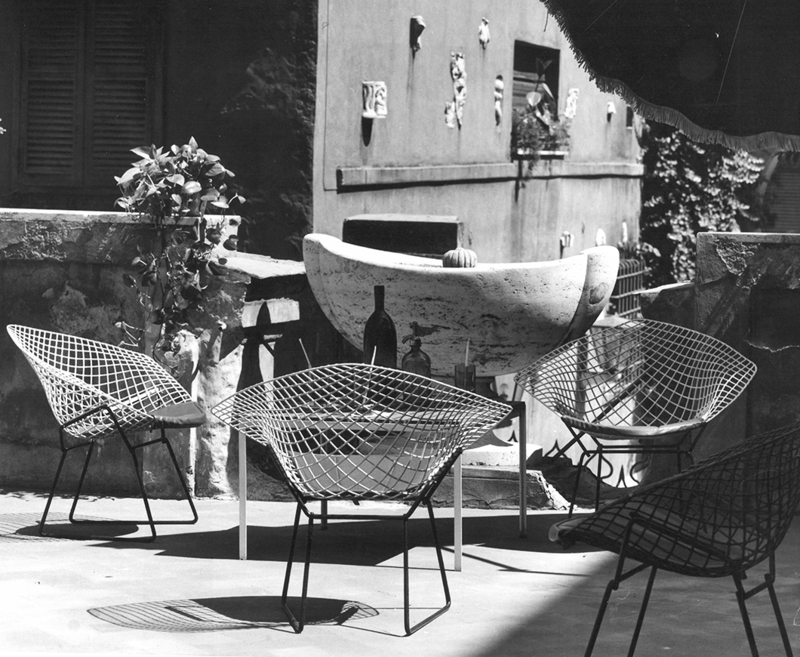 Designed by Harry Bertoia in 1953, the Diamond and Side Chairs were originally available with a black base, contrasting basket and vinyl seat pad. Designers and decorators took advantage of the ability to bring graphic personality to the sculptural chairs. Florence Knoll, for instance, made use of black, white and yellow Bertoia Side Chairs in her 1953 design of the Merchandise Mart Showroom in Chicago, Illinois. Bertoia Two-Tone Side Chairs in Knoll Showroom at Merchandise Mart in Chicago, Illinois, 1953. Bertoia Side Chairs shown in green, blue, white, red, white, yellow, black and chrome colorways. Image from the Knoll Archive. Bertoia, too, was fascinated by color and its effects on space. Years after the Bertoia Collection’s launch, Bertoia expressed interest in broadening his investigation in form and material to include color: "I would like to enter into the investigation of space or color. That is a field that has been almost neglected, very little has been done. I would like to take a solid material, colorful, and multiply it to the point where it actually produces an atmospheric color, so there is a play of sunlight and a play of matter." In subsequent decades, Knoll expanded the Bertoia Collection’s palette to include red, blue, green and yellow. 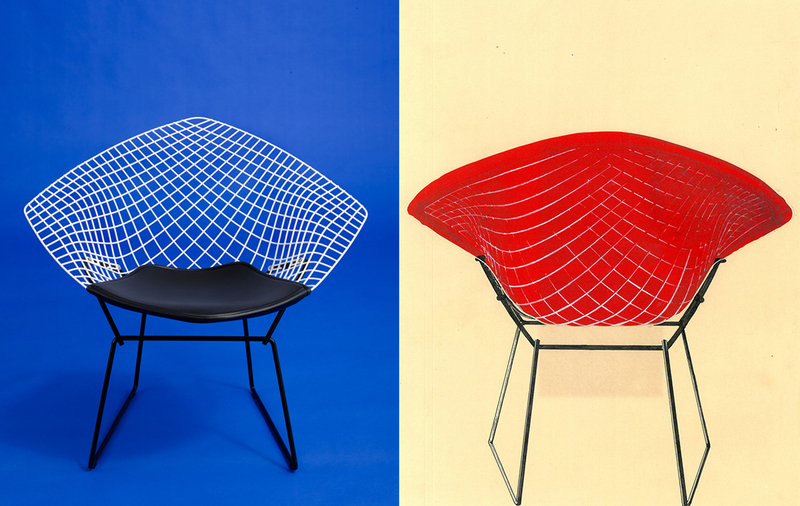 Right: A hand-painted advertisement for the Bertoia Two-Tone Diamond Chair from the 1950s. Image from the Knoll Archive. 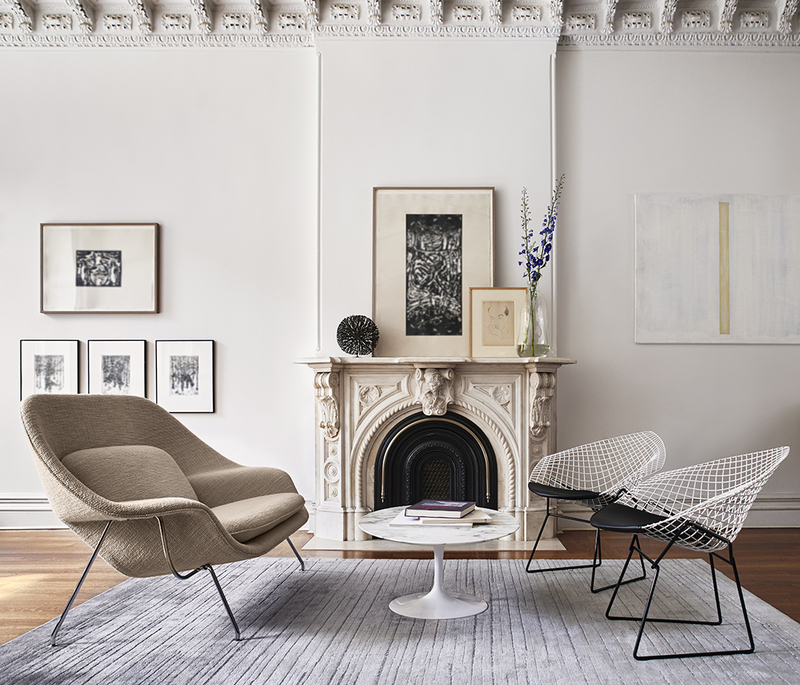 Bertoia Two-Tone takes its inspiration from the chairs’ graphic history, permitting playful combinations of black, white, red, blue and chrome and bringing Bertoia's explorations in space and color to the comforts of home.